Day two at the return of Slam Dunk to the Beach is in the books. Sunday’s second session started with an upset, as Sunrise Christian (KS) edged USA Today’s No. 23 team in the nation, Christ The King (NY), 66-57. St. Vincent-St. Mary then made a strong tournament debut by dispatching Salesianum (DE), 77-58. In the nightcap Gonzaga College (DC) pulled away from Gill St Bernard’s (NJ) in the second half to earn a 70-49 triumph. The evening began with a matchup of national powers that somehow lived up to the hype. Sunrise Christian led by just two after the first quarter, by three at the half and by only a single point entering the final period. But it was a foul with 1:38 left in the third quarter that went a long way toward deciding the contest’s outcome. With Christ The King up 35-34 and with momentum on their side, Rawle Alkins, the 35th ranked junior in the country according to ESPN, picked up his fourth foul and had to take a seat. His absence sparked a 19-8 Sunrise Christian run that tilted the game in the Buffaloes’ direction. Alkins finished the night with a game-high 23 points and three blocks. He also provided the most electric moment of the first two days of Slam Dunk to the Beach with his acrobatic, one-hand jam just before picking up foul number four. One thing Alkins did not do much of on Sunday was rebound the ball. A night after he pulled down 18 boards in a victory over Gonzaga College, the junior was held to just three rebounds–none of which came on the offensive end. It was a fact that did not go unnoticed by Sunrise Christian head coach Kyle Lindsted. As a team, Sunrise Christian finished the night plus-16 on the glass. Radshad Davis led the way with 13 rebounds and he also added 11 points. Dainan Swoope paced the Sunrise Christian offense with 16 points, while C.J. Keyser chipped in with 11 points and seven boards. with a game-high 28. It was a solid bounce back performance for DiVincenzo, who had missed 14 of his 17 shots from the floor in Saturday’s loss to Sanford. But St. Vincent-St. Mary had too much firepower. 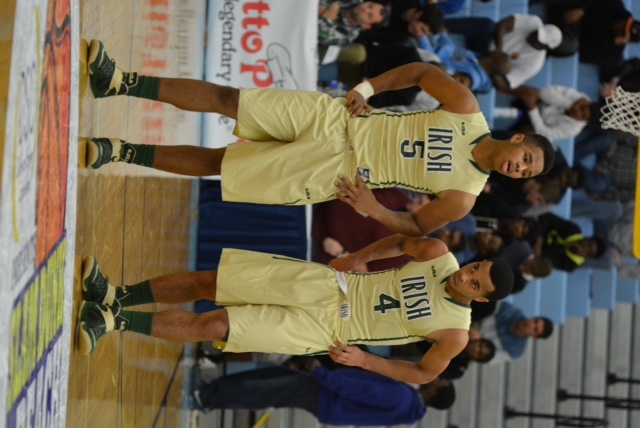 In their first game of the tournament the Fighting Irish got superb nights from Jibri Blount and Josh Williams. Blount had 22 points and five rebounds while Williams added 21 points and four assists. “Well those are my two seniors,” said St. Vincent-St. Mary head coach Dru Joyce. “They’re senior leaders, and they did what they’re supposed to do. Josh has been great all season long. He’s led verbally and by example, and he’s a Division One player. He made shots. He kept us calm and then he took the tough defensive assignment to guard their best player [DeVincenzo]. As a team, St. Vincent-St. Mary shot a scorching 54 percent from the field, which allowed them to win going away despite finishing the night minus-13 in rebounding margin. The nightcap saw Gonzaga wear Gill St. Bernard’s down in a game that turned into a laugher in the second half. Gonzaga controlled the early portion of the contest, drawing five fouls on Gill St. Berndard’s in the contest’s first three minutes. The Eagles led by as many as nine points in the opening quarter and held a 17-12 advantage after eight minutes. Despite playing without Tyus Battle, ESPN’s 14th-ranked junior in the country, Gil St. Bernard’s responded with a 10-0 run in the second quarter to take its first lead of the game, 25-24. Gonzaga grabbed momentum back with two quick buckets and held a slim 28-27 edge at intermission. That carried over into the third quarter, which saw the Eagles explode for 23 points and open up a 13-point lead. The advantage swelled to as large as 23 in the fourth quarter as Gonzaga cruised down the stretch. Gonzaga got 16 points on 6-of-8 shooting from Dayton commit Sam Miller. Meanwhile, Bryant Crawford, the 16th-ranked point guard in the class of 2015 by ESPN, flirted with a triple double. The Wake Forest commit notched nine points, eight rebounds and eight assists. Slam Dunk to the Beach continues on Monday with six more games over a pair of sessions. The action gets underway at 12 p.m., as nationally ranked Christ The King (NY) looks to bounce back against Sanford (DE). It continues at 1:30 p.m. when The Haverford School (PA) gets a shot at USA Today’s No. 17 team in the nation, Our Savior New American (NY). Session one concludes at 3 p.m. with a First State fight between Caesar Rodney and Salesianum. “Well those are my two seniors,” said St. Vincent-St. Mary head coach Dru Joyce. They’re senior leaders, and they did what they’re supposed to do. Josh has been great all season long. He’s led verbally and by example, and he’s a Division One player. He made shots. He kept us calm and then he took the tough defensive assignment to guard their best player [DeVincenzo].